This site has my pages on places in England, Scotland, Wales and France; and my Animal Pages (updated 16/01/2013) which cover my Horses, Dogs, Cats and other animals. I hope it will give you a taste of the places to help you plan a visit or to bring back memories of visits to them. A new page for a new marsh - Steart Marshes in Somerset. Burgh Island is a new page with some photos of this island off the coast of South Devon at Bigbury on Sea. After a long gap, an update! Some slightly different photos added to West Bay 13 April 2014. Photos of a visit to Exbury Gardens in June 2013 added. New Forest has been updated with lots of new photos of various parts of the forest. Now spring has begun to warm new photos added to West Bay - which is now perhaps becoming better known as Broadchurch in the ITV series. Wintery scenes added to those of autumn colours at Hestercombe plus some spring scenes added 7 April. Exmoor has some new photos added. East Anglia has views of Suffolk Coast, Great Yarmouth, Reedham Ferry, Maldon and Flatford Mill - more to come soon. Kingsbridge is a new page of views of this South Devon town. Sidmouth has new photos including a rock fall on the cliffs. Mudeford Quay has more photos of this attractive area at the mouth of Christchurch Harbour in Dorset. Aberystwyth has a selection of views of this mid Wales resort and university town. Several new photos added to Bridgwater & Taunton Canal which now covers the whole length of the canal. Dartmouth has had several photos added, including the Castle and Bayards Cove. Torbay has new photos of Paignton and Goodrington. Hestercombe has had a lot of photos added of these gardens near Taunton in Somerset. Morwellham Quay is a new page with photos of this interesting industrial heritage site which was also the location for the TV series "Edwardian Farm"
There is a video and some photos of a wild dolphin at Portland, Dorset on Dolphin in Dorset. There were people swimming with him, he was coming to them for attention, an amazing sight and experience for those who were lucky enough to be there. There are many photos included within each interest section. This is my favourite photo of me driving my mare Shanty. 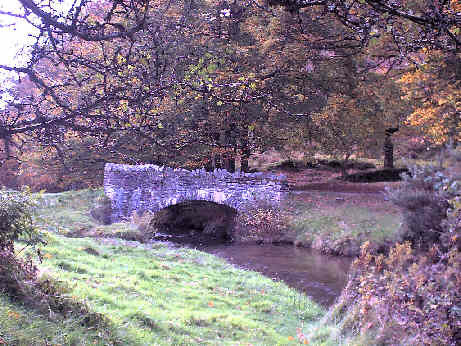 Robbers Bridge in Exmoor's Doone Valley. This site was last updated 08/05/2017.